With fingers burning from icy damp and numb toes I grapple with the monthly chores in the Kitchen Garden. All sense of decorum is lost in the scrabble to stay warm, gaudy ski-trousers and layer upon layer of decidedly unstylish attire, flinging muck to and fro over the beds in yet another sleety downpour. I am in stark contrast to the garden, it’s elegant lines emphasised by the hoary silver frost. How dignified and dainty the plaited bay trees look in their umber ‘Long Toms’ with a dusting of powdery snow atop them. The stark winter landscape makes the most of features like these. 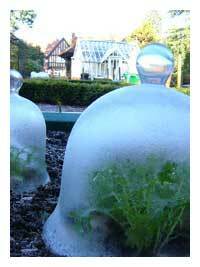 I peer into frosted ’Bell Cloches’ catching a glimpse of misted Mizuna, how can something so delicate be so hardy? Lamb's lettuce is one of the toughest leaves in the garden though, it has survived the regular harsh frosts we have experienced this winter, shiny new leaves pushing up again and again after the crown gets completely desiccated by the freezer draw conditions, in fact it is so persistent that I will simply have to mulch around it! I cannot bear to pull up the lovely emerald green rosettes just yet. The winter greens in our ‘Earthbox’ have been imbued with restored vigour now that the days are lengthening. The Chinese cabbage has been cut and is ‘coming again’ as is the spinach and the rest of the oriental leaves, all crops are much valued at this time of year and I glad that I made those autumn sowings all those months ago. I love a bit of muck! Organic gardening is all about putting something in to get the best out. My attempts to enrich the ground here at the garden have been thwarted by all this cold. You simply cannot spread bags of frozen manure, so I was forced to just wait for what seemed like an age before Jack Frost loosened his grip on this corner of East Anglia. Hence the working in decidedly unfortunate conditions described above. Warming up the beds is the next job after spreading all that glorious muck around. The winter armoury includes fleeces, plastic and cloches and they are all deployed around the garden to raise the soil temperatures ready for early crops. 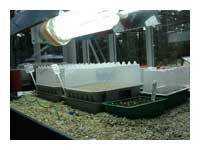 In the greenhouse the Grow Light kit shines out and banishes that horribly repressive winter grey. Little tomato seedlings basking in its unseasonal glow, alongside are the aubergines and peppers neatly sowed in compact root trainers. These fit a lot of seedlings into a small space without the horrible teasing out that can result in a too densely sown seed tray. I have plumped for two varieties of aubergine ‘Black Beauty’ this one was a real favourite of Stephanie’s last season, and the striking white ‘Rosa D’Bianca’. I have scaled down my rather eclectic and varied mix of tomatoes this year, going for some more heavy croppers including that good old ‘Money Maker’. My grandad was a grower and he swore by these plants, bearers of a heavy crop of uniformly...”nice marrrtooes”. Peppers are something my grandad did not grow, but I hope to make him proud (up there in his pottering shed in the clouds) with a nice crop of ‘Marconi’ and ‘Sweet D’Asti Giallo’. Hopefully Stephanie will like them too! Although the Grow Lights do give off a gentle heat I have deployed a heat mat under my precious seedlings to make sure everything is at the optimum temperature. If you want a lower temperature for some seeds you can raise them up from the mat a little (I turn an empty seed tray upside down and pop the sown seed tray on top) check the temperature with a thermometer to get it just right. 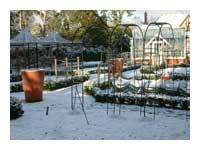 Well there’s cold, very cold and then there’s the potting shed at midday early February this year. Brrrr does not really even begin to convey the penetrating cold that seemed to permeate every inch of the garden including my bones; saying this however, I am well aware that we were rather lucky here in Suffolk, and that much of the country was brought to near standstill, roll on the spring and some march sunshine.